Breakthroughs are rarely pretty. I’m living proof. I shot this video early in the morning of October 1st and I posted it to Facebook without watching it. I do that when my emotions are strong so I don’t give myself a chance to change my mind. This video was public for almost 2 full days before I finally watched. Which is a good thing as I might have deleted it right away. The comments and feedback I received convinced me it was indeed a good one to release. I was quite surprised to see this video get shared around Facebook by a few friends, that’s what finally made me watch it. I used to hit the wall of fear and not just bounce off of it, but run away from it. Sometimes trying to run away for good. I’d run so hard and so far from fear that I saw ending my life as my only option. Now, I can usually see fear not as a dangerous warning to be avoided, but as a welcoming alert telling me that some big personal growth and transformation is right around the corner, as long as I go through the fear. This week I was getting caught up in the thought that since I’ve gone through the fear of something once it won’t show up again. But it does and it will continue to. We sometimes need to get over, under or through that wall of fear multiple times in a single day. Whenever I find myself having a “dark night of the soul” experience, as long as I allow myself to feel and express everything that is coming up for me (fears, doubts, anything) without judgement, I can move through it. I first discovered this on vacation. I’ve been on some thrilling international adventures with Class 4 & 5 white water rafting, rappelling hundreds of feet and all sort of things I don’t do in a normal day. For some reason, because I’m on vacation I’m willing to take risks and be vulnerable. Years ago I decided to live my life like I was on vacation – not in a relaxation or partying sense, but in a risk embracing, do what I fear, this may be my last day approach to life. Sometimes, that leads to my crying alone in hotel rooms. And I’m fine with that. Don’t let fear – or even reason – prevent you from overcoming barriers. Trust your instincts and push through. Remember to keep going and don’t stop. This is your time to use supreme effort to break out of your own shell and reach the light. The energy of “breaking through” isn’t always neat and tidy, so it’s okay to feel messy and chaotic for a while. Eventually, the situation will sort itself out and peace will reign. 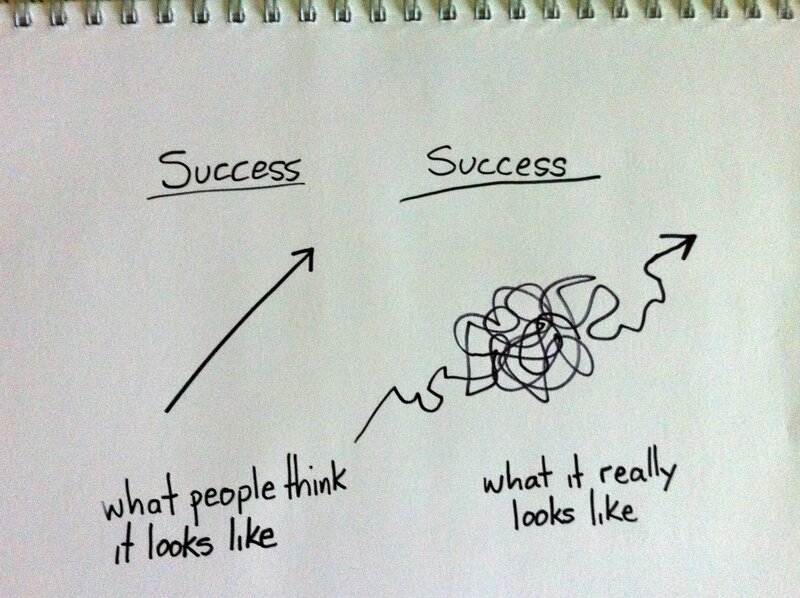 Progress and success are rarely a pretty journey. It is okay to feel messy and chaotic for a while. In my experience, it has always been worth the few moments of discomfort to break though to the joy and freedom. That joy is always there. Sometimes its hiding just behind the fear. Keep scaling those barriers! After all, most of the time we are the ones who put them there. Thank you, Karen. Hope we cross paths on our roads. Thank you for your Blog Post and Video! WOWZA! It reminded me of an experience that was profound and this touched everyone in my family! My brother was brilliant – (scored 800 out of 800) when he took his math achievements in high school. He was an avid tennis player, a gifted violinist and had an amazing sense of humor! He scored big time in his career too. Turns out he was #10 in his graduating Class at Stevens Tech and later earned his actuarial fellowship by the time he was just 26 years old. He was the gold dust above outstanding in practically everything he touched. He was so multi-faceted –and mega- talented. He had Smarts / Humor / Good Looks / and had many Career Win’s along the way. And then, after a few job losses — It happened! He decided to commit suicide at the age of 42, leaving a 16 year old daughter and a wife who adored him. My heart goes out to people who decide to make this choice and my heart also goes out to the people who are left behind to witness this choice. Andy –Thank you for taking a stand for us. We need your wisdom – strength – vulnerabllity and big heart. So sorry for your loss, Donna. Suicide is a tragic decision made when no other choices seem apparent. So much of my mission is to show we always have options and choices, no matter what the situation. Leave a comment for: "Progress Not Perfection"